The dialogue format is a deceptively simple one without any literary pretensions, and perhaps that makes it an ideal crucible for the genius inherent in the Self-aware to be inspired and expressed in the most dramatic, direct, and practical words. In the course of their candid revelations about their deepest fears and hopes, Isaac’s audience finds their conditioned reactions derailed by his steadfast insistence that one Reality fits all, and there’s no escape from it. 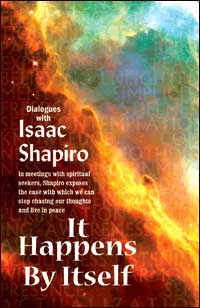 These dialogues with a Self-realized teacher as highly regarded as Isaac Shapiro offer an opportunity to be yourself as never before, an encouragement to experience life directly, a call to let go of your false identity. This is a radical’s invitation to come to the end of “good” and “bad,” and see beyond the drama of identification with our life stories. Isaac is from South Africa and now lives in Australia. Mentored by one of the greatest spiritual teachers of the 20th century, H.W.L. Poonja (known as “Papaji”) of Lucknow, India, he was urged by Papaji to share his insights with others. Isaac guides seekers from all parts of the world, gently, with compassion and humor, away from suffering and confusion to the very heart of their being, to freedom, to That which is. And how does all this happen? It happens by itself. . “At the cutting edge of spiritual exploration. He is an embodiment of the New Man.” — ARJUNA ARDAGH, author of the best-selling The Translucent Revolution. ISBN: 81-89658-02-6; Price: Rs. 275; Pages:192; Size:5.5 x 8.5 in.